I Fell Off The Weight Watchers Wagon And I’m Pointing The Finger At Dolly Parton. I think about writing new posts all of the time and then I look up and it is two weeks later. I don’t quite know how that happens, but it does. It could be because we are selling our house and have to be out of it by the end of this month. Then there’s the full time job. Then there’s the 2-year-old and countless other things. Nonetheless, this is going to be a mashup of updates and a few recipes sprinkled in for good measure. Last Wednesday was a big day for me because I jumped on the scale (my official weigh in day) and realized that in a little over two months I’ve lost exactly 20 pounds. It is absolutely amazing how fast it can come off when you finally make a commitment to the process. I think I spent more time (okay, years and years) thinking about how long it would take me to lose 20 or 30 pounds and all that thinking ended in me not even trying. Nonetheless, 20 pounds is 20 pounds and let us all say AMEN. This weekend was one of the first times I truly fell off of the Weight Watchers wagon. Why? 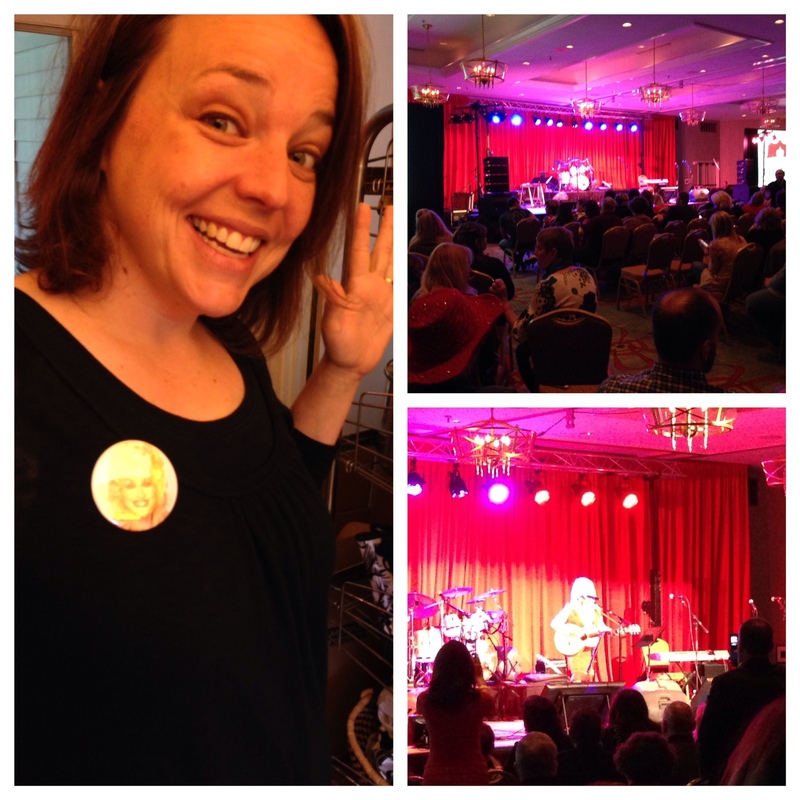 Ahem…because I had a date with Dolly Parton and 250 or so other lucky folks. You see, back when my Dad was really sick I got an email from a friend I’ve known since I was 6 or 7 years old and we reconnected on Facebook years later. She sent me an email at a really rough time for me saying that I need to mark a weekend in April on my calendar and she’d be in touch later about it. I marked it on my calendar. When the news was made public, she informed me that Dolly Parton — my hero and mentor — would be singing at an event. I got tickets. I drove to Nashville for less than 24 hours to sit in a hotel ballroom and watch a bunch of talented women – one of which happened to be Dolly Parton. I’m talking less than 300 people in this room. It was insane. I mean look at how insane this was!! Next thing I know, I’m honky tonking and eating a cheeseburger and french fries at 1 am. See? Off the wagon. But I danced and walked and exercised and so I don’t feel so bad. That’s the thing– I’ve been trying to build up extra activity points for times like these. Needless to say, I’m not even going to try to enter in the points from my brief yet amazing trip to Nashville. Surely that’s okay. Right? I bet Dolly would agree with me. Now to some recipes! Last week I found this Spaghetti Squash and Cheese recipe on www.laaloosh.com. 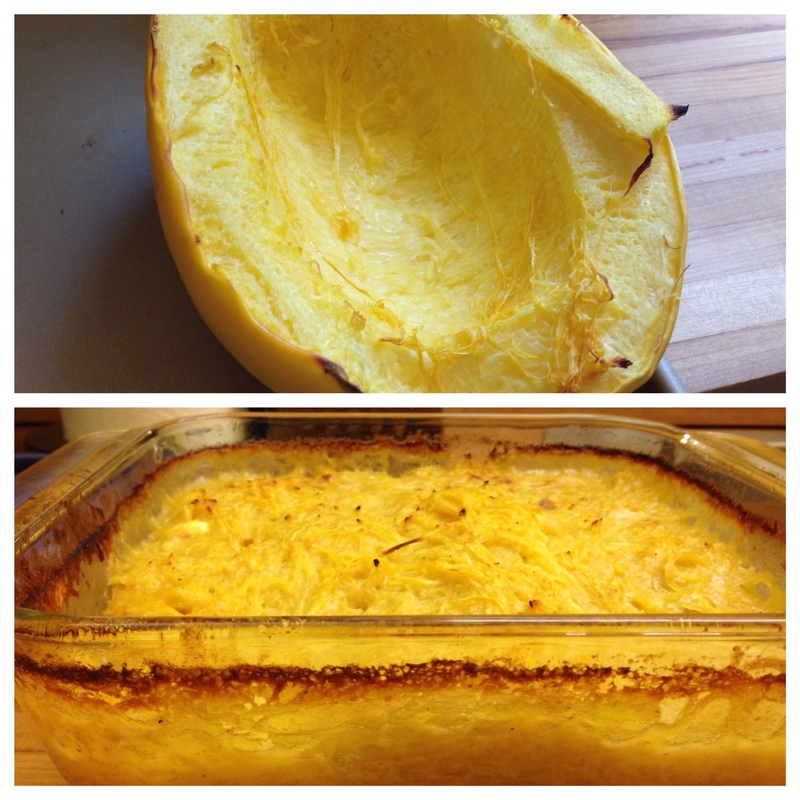 I baked the spaghetti squash in advance (last Sunday) so that I could easily pull it together during the week. Though this dish is very low in points, it needed a bit more salt or cheese (yes, I probably just needed more cheese but then it wouldn’t be 4 points and yadda yadda yadda). My advice would be to taste it as you go so you know you have enough seasoning and ooooomph before you bake it. Another recipe I tried from http://www.laaloosh.com was her Sausage, Artichoke, and Broccoli Casserole, which is 5 points per serving. This dish was really flavorful BUT I think I made some tweaks that didn’t work. For example, I needed to cook cauliflower and decided to add cauliflower to the ingredient mix, which messed up the ratio. In other words, my casserole was a little unruly and dry. 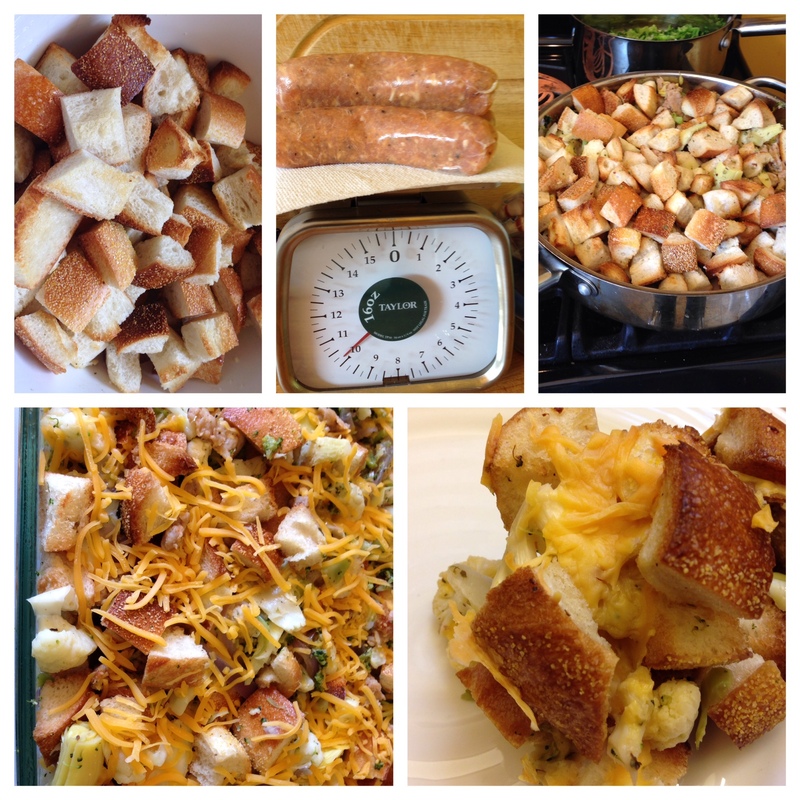 I have a feeling if I would have stuck to the ingredients listed in the recipe AND cut my bread in smaller cubes, it would have been a little more casserole-y. It was still delicious and we ate it almost every night last week. Turkey Sandwich, Pickles, and Fruit for a total of 5 points! Sara Lee 45-calorie bread (2), 2 ounces of deli turkey (1), mayonnaise (1), Sargento Ultra Thin Cheese slices (1), cucumbers, lettuce, and any other free veggie I can find. I always eat a pickle to trick me into believing I’m eating something crunchy and salty (I know, I know…a pickle is NOT the same thing as a chip. I haven’t lost my mind. I am aware that they are different things, but I am a chipaholic so I have to make believe sometimes). 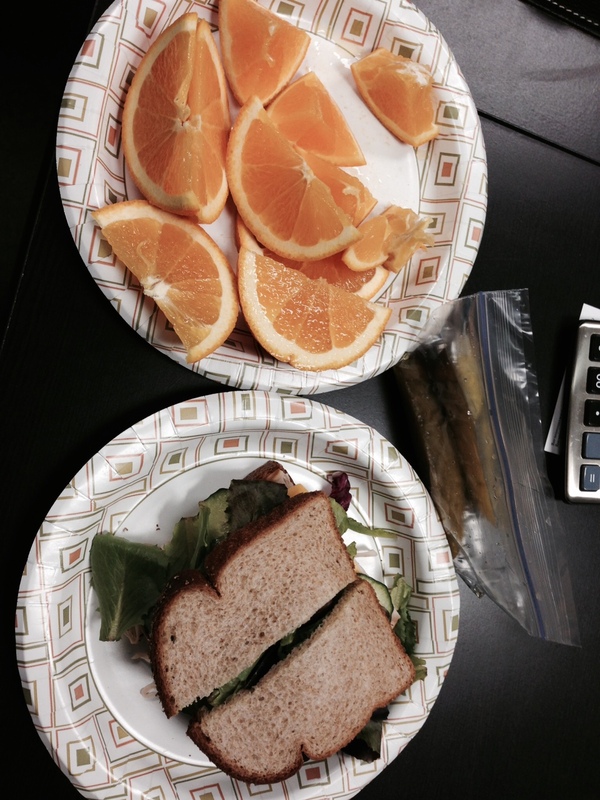 The orange has been super helpful because it takes a long time to eat, which is another way of make believing I’m eating a huge lunch when I’m not. Hey! I have to do whatever I can to maintain sanity. I even turned down TWO staff lunches where pizza was served both times. Um, that was hard. For a mid-morning snack, I usually eat a banana (o pts) and for a mid-afternoon snack I eat Chobani’s Simply 100 greek yogurt with fruit on the bottom (2 pts for the entire small container). I can’t wait to try the sausage, broccoli, artichoke casserole! Thanks for sharing and good job recognizing you fell off and then hopping back on. Keep it up!